All of us at MyGolfRanking hope that you and your club are having a successful 2018 and have been making the most of the wonderful golfing weather many of us have been enjoying. 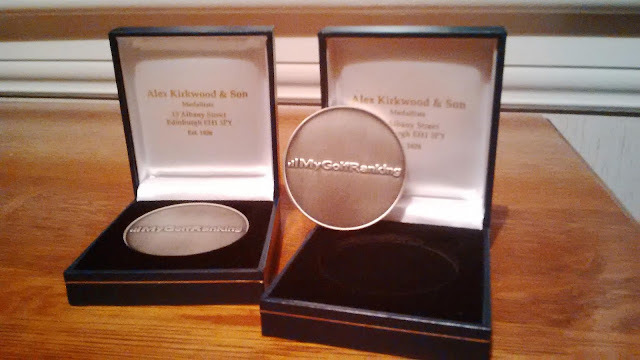 As we move towards autumn and the end of the season, many clubs will be turning their attention to their annual ‘Golfer of the Year’ awards, and we are able to once again supply our much-treasured MGR Golfer/Club of the Year Medals for your 2018 prize presentation. To ensure delivery in good time for your big night, why not pre-order them from us now? The MyGolfRanking.net Golfers of the Year are those club members, or clubs in the case of counties or areas, who are leading on 1st October 2018. Once we receive your order, we will supply and deliver each engraved, boxed medal to you at a cost of £25 + VAT, which will be invoiced on delivery.